Shopping for a new Subaru Outback? The Outback Touring’s brown leather is nice, but its roof rack lacks built-in cross rails like the rest of the lineup. The 2019 Subaru Outback splits the difference between passenger car and crossover SUV and it does so exceptionally well. With the Outback, Subaru has created a vehicle that meets the needs of most drivers while neglecting few. Though the 2019 Outback is begging to sprout some gray hairs, it still rates highly in our eyes—and additional standard safety gear added for the 2019 model year makes it an even more appealing pick. For 2019, Subaru added automatic emergency braking, adaptive cruise control, and active lane control standard fare on every Outback trim level—base, Premium, Limited, and Touring. Making this previously optional gear mandatory earns our favor, even if it does reduce the number of Outback permutations. All trims come standard with a CVT that mimics a conventional automatic when pressed and keeps the standard flat-4 and optional flat-6 engines civilized in normal driving situations. 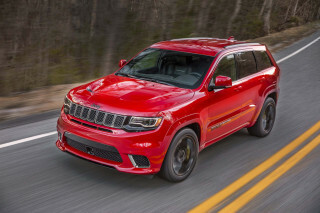 A 2.5-liter flat-4 rated at 175 horsepower is standard fare on all trims, while Limited and Tourings offer a 3.6-liter flat-6 that bumps power to 256 hp. 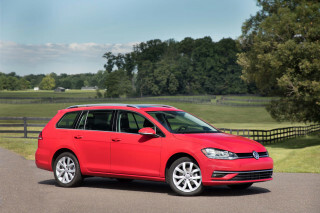 The base engine delivers adequate, but not thrilling power, offset by impressive fuel economy. The optional flat-6 is far thirstier but almost mandatory for drivers who might tow or who routinely climb long grades. The Outback’s 8.7-inch running ground clearance and standard all-wheel drive allow it to trundle down dirt roads better than some crossover SUVs that have gone soft—we’re looking at you, Ford Explorer and Nissan Pathfinder. Yet with its structure and suspension closely aligned with the Legacy sedan, the Outback boasts tall-car road manners that help it feel confident on a twisty road and stable at highway speeds. Inside, the Outback has good room for five passengers and features logically arrayed controls. A 6.5-inch touchscreen for infotainment with Apple CarPlay and Android Auto is standard, but Premium and higher trims feature an 8.0-inch touchscreen and available baked-in navigation. Subaru adds more standard safety gear this year, which augments the Outback's traditionally strong crash-test scores. The handsome 2019 Subaru Outback looks as good dirty as it does all cleaned up. Outside, the Outback looks as though it’s a Legacy wagon riding on stilts, although a wagon Legacy doesn’t exist. Its styling is simple, with unpainted lower bumpers and rocker panel trim designed to give it a more rugged look. Up top, the tall roof rack on most trims doesn’t help with aerodynamics but adds utility. Hidden cross bars deploy when called upon to lug bikes, skis, and cargo carriers. An Outback with an empty roof rack looks like it’s missing something, if you ask us. 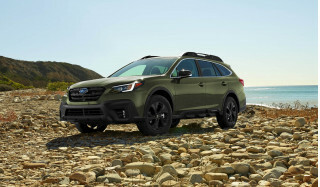 One note: while little separates the styling of the base, Premium, and Limited Outbacks other than larger wheels on Limiteds and untinted rear windows on base models, the range-topping Touring has a low-profile roof rack without cross bars. Those are a pricey optional extra worth taking into account. The Outback’s interior lacks the woodsy look some buyers might want, but it’s well-organized and nicely styled. Most controls are grouped below the 6.5- or 8.0-inch touchscreens, with some auxiliary functions crowded to the left of the steering wheel. Base and Premium Outbacks feature cloth upholstery and Limited and Tourings have leather seats. Contrasting stitching on the dashboard sets Premium and higher trims apart. Decent off-road chops and a good ride quality help make up for underwhelming engines on the 2019 Subaru Outback. Most Outbacks leave the automaker’s Indiana assembly plant with a 2.5-liter flat-4 underhood, rated at 175 horsepower and 174 pound-feet of torque. Good tuning of the standard continuously variable transmission (CVT) makes the Outback feel more sprightly at city speeds than its low power output suggests, but this crossover SUV runs out of steam for highway passing and when loaded up with passengers and gear. The optional 3.6-liter flat-6 puts out 256 hp and 247 pound-feet, which helps but doesn’t turn it into a speed demon. In either application, the CVT does its best to keep revs low in normal driving to save fuel and then imitates a conventional automatic with a shift point-like behavior under hard acceleration. The snappy throttle response that helps the Outback feel zippier around town than it is does take some getting used to, however. Since it has more suspension travel than a car but a lower center of gravity than conventional crossover SUVs, the Outback feels as confident snaking through canyon roads as it does at highway speeds. Light, but direct steering fed through a thick-rimmed three-spoke wheel helps, as does good directional stability. The 17-inch wheels standard on base and Premium trims deliver a soft ride. Opting for the 18s on Limiteds and Premiums adds a hint more road feedback without too much detriment. Unlike most crossover SUVs, the Outback comes standard with all-wheel drive. That may be a demerit in Miami, but it works in most places to provide terrific traction regardless of terrain. For off-road and snow use, an X-Mode button modifies traction control parameters and activates hill-descent control. With more ground clearance and taller tire sidewalls than many rivals, the Outback happily scampers along unpaved roads. 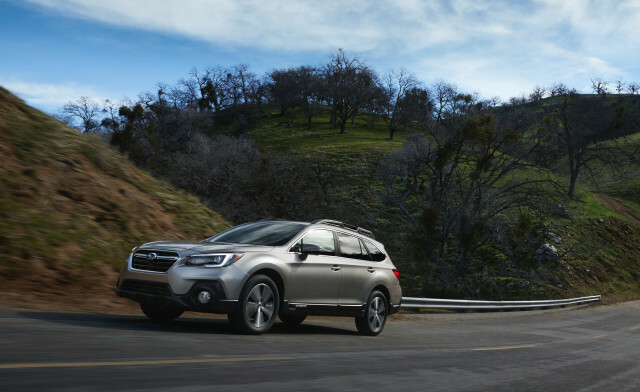 A roomy, well-made interior is one of the 2019 Subaru Outback’s prime assets. Front seat passengers have all-day comfortable seats with long bases and good support. An 8-way manual seat comes standard on base trims, but Premium and higher Outbacks feature 10-way power with a wide range of adjustment. Rear-seat riders have exceptional stretch-out space and there’s even enough room for three in a pinch. Outback Limiteds have rear-seat climate control vents that we wish were standard on all trims. The cloth upholstery fitted to base and Premium trims feels fine, but the optional leather on Limited and Touring trims may have come from cows that ate a steady diet of vinyl. 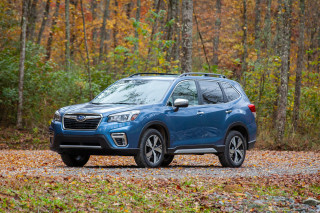 Out back—punny, aren’t we?—the Outback has a wide, wagon-like cargo area that offers good utility but not as much vertical height as some crossover SUVs such as Subaru’s own Forester. On paper, it works out to about 36 cubic feet with the rear seats upright and a maximum of 73 cubes with the 60/40-split seat backs folded flat. A power liftgate is on the options list for the Outback Premium and it comes standard on Limited and Touring trims. A wide array of standard safety gear and good crash-test scores make the 2019 Subaru Outback a smart choice for families. This year, all Outback trims have standard automatic emergency braking, adaptive cruise control, and active lane control in addition to seven airbags and anti-lock brakes. Blind-spot monitors are optional on the Outback Premium and standard on Limited and Touring grades. All versions of the Outback have exceptional outward vision thanks to relatively thin roof pillars and a low belt line. The 2019 Subaru Outback lacks for little in base trim and can feel like a genuine luxury crossover when fully equipped. This year’s addition of automatic emergency braking, adaptive cruise control, and active lane control on all trims means that the base Outback 2.5i is a great starting point. Its 6.5-inch touchscreen for infotainment features Apple CarPlay and Android Auto compatibility and its roof rack, power features, and all-wheel drive make it a good value for about $27,300. The step-up Outback 2.5i Premium costs about $29,400, and adds in niceties such as a power driver’s seat, automatic climate control, heated front seats, an 8.0-inch touchscreen, two additional speakers, and a leather-wrapped steering wheel. Add in the optional moonroof and power liftgate and the Premium trim is still a good value. With its leather upholstery, Harman Kardon audio system, 18-inch wheels, heated rear seats, power liftgate, and keyless ignition, the Outback 2.5i Limited starts to feel like a luxury crossover. 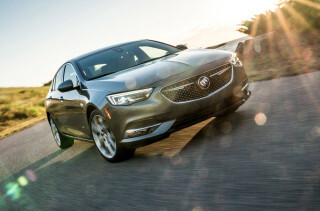 On the Limited, a 3.6-liter flat-6 is optional for about $2,100 extra. The range-topping Outback 2.5i Touring throws in more luxuries such as a heated steering wheel, LED headlights, and navigation, but at about $37,800 with the 4-cylinder and nearly $40,000 with the flat-6, it’s not as good of a value. Our advice? Stick with the Premium and Limited trims for the Outback sweet spot. The 2019 Subaru Outback delivers good fuel economy with its base engine. With the base 2.5-liter flat-4 fitted to the vast majority of 2019 Outbacks, the EPA rates the crossover SUV at 25 mpg city, 32 highway, 28 combined. Pop for the more powerful flat-6 and those figures slide to 20/27/22 mpg. All Outbacks use regular unleaded fuel, unlike some turbocharged rivals that sip pricier premium unleaded.